– The Redundancy features became more powerful and simplified on ver3.9.1. We strongly recommend to upgrade Brekeke PBX to ver3.9.1 or later. – Root privilege is required by Brekeke Redundancy. – We recommend RedHat, CentOS and Fedora for Linux server. 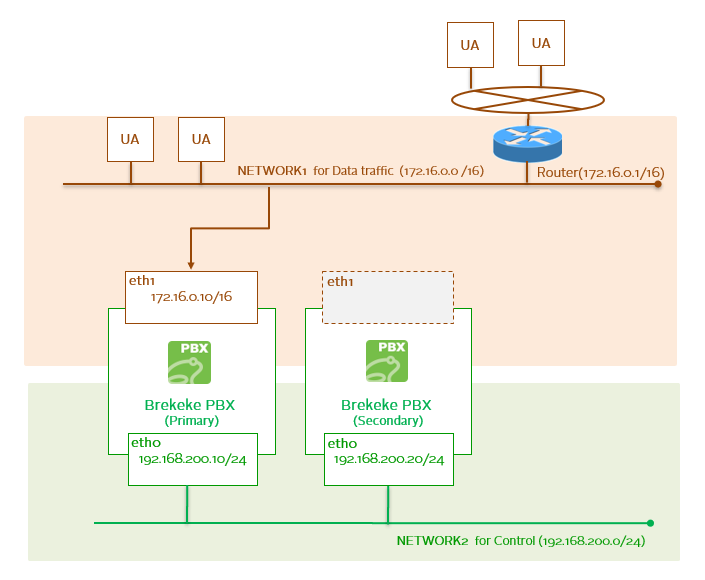 Install Brekeke PBX on two servers, one is primary server, the other is secondary server. Both servers need to have license with options for the “Redundancy” option. 2. Keep the same system time on both Brekeke servers. 3. The settings on both PBX should be the same at the beginning. Such as, PBX users, ARS rules, network interface addresses at bundled SIP Server, dial plans, user authentication settings…You can backup primary settings and restore it on secondary to let both server setting identical. SERVICE_IP_ADDRESS: 172.16.0.10 / 255.255.0.0, the primary IP which is in different segment from secondary server IP. 6. Set port forwarding at router which Brekeke PBX are behind and forward SIP and RTP ports to SERVICE IP ADDRESS. This SERVICE_IP_ADDRESS is assigned on primary server at the beginning. When failover happens, Brekeke heartbeat action will add SERVICE_IP_ADDRESS on secondary server. 7. The accounts under Brekeke PBX bundled SIP server > [Aliases] will not be mirrored on secondary server. Please use shared third party database or other solutions to synchronize user authentication accounts on both primary and secondary servers. If shared third party database is used at both primary and secondary Brekeke PBX bundled SIP server, do not need to set up mirroring at both servers any more. 8. Set the same realm (if required). 9. Connect from UA to Brekeke PBX. For UAs/phones at WAN, the router global IP should be used as registrar and proxy address at UAs/phone settings.